We call our classified section “Notes and Notices” because we don’t classify the ads much. Holding a garage sale? Selling or renting your home, need an employee, tutoring, teaching, in-home child care? We accept short reader ads (up to 50 words) for a fee of $25. The ads, with check, should be mailed to The Bright Side, 3330 Cumberland Blvd., Suite 500, Atlanta GA 30339; (No copy accepted by phone) and received prior to our deadline of the 23rd of the month preceding publication. Publication is the first week of the month. Ad copy may also be e-mailed to ads@www.brightsidecobb.com. We also accept credit card payment. Home-based business ads accepted only if they do not conflict with our display advertisers. House for sale ads are for homeowners only. For information, call 770-426-9388 or e-mail to ads@www.brightsidecobb.com. SEEKING CLASS OF 1976. Marietta High School Class of 1976 Reunion October 7 and 8th. We need classmates’ current addresses and emails. For more information contact – Laura Harding (lwh1316@comcast.net) or join our FB page at Marietta High School Class of 1976. LITTLE BEAR TREE SERVICE offers complete tree removal with care and quality assured. At Little Bear we are “pruning and shaping specialists, storm damage specialists, fully insured, and provide 24 hour emergency service.” Ask about our monthly specials. Free, prompt estimates and work at competitive rates. Call 404-975-9831. HABITAT FOR HUMANITY RESTORE You are invited to a Volunteer Information Session/Open House at the Habitat for Humanity ReStore in Smyrna on Saturday, July 2nd, at 10:30 AM! Please join us for this informative presentation about volunteering at the Habitat ReStore. The ReStore sells donated new and gently-used furniture, household décor, appliances, and building supplies to the general public and is located at 3315 S. Cobb Drive, Smyrna 30080. The ReStore helps support NW Metro Atlanta Habitat for Humanity, as they provide affordable housing for families in the community who need it. For more information, or to register, contact James Currie at jcurrie@habitat.org or 770-415-1625. MEALS ON WHEELS: Meals on Wheels has a great opportunity for volunteers to deliver meals to homebound seniors who are waiting for this needed service. Cobb Senior Services is in need of volunteer drivers in Mableton, Marietta and Smyrna. If you have some time to volunteer as a MOW driver, or if you belong to an organization or business that would like to “Adopt-A-Route,” call Volunteer Services at 770-528-5381. CAREGIVERS NEEDED: Help Wanted. Comfort Keepers, an industry leader in in-home caregiving, needs local CNA’s and Companion Caregivers to assist adults in Marietta, Kennesaw, Acworth, Smyrna, Austell and Mableton. Interviewing daily for immediate openings, full or part-time shifts.. Call 678-354-0102. EXTRA COPIES: Looking for an extra copy of The Bright Side? Copies are available each month in the Smyrna Library, the Vinings Historic Society office, the Smyrna Community Center, Chick-fil-a Cumberland Mall and Akers Mill, South Cobb Drive Kroger and at many of our advertisers’ locations. 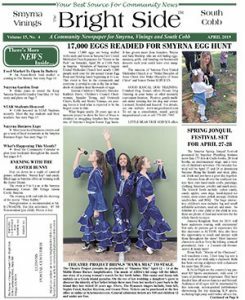 Extra copies of our Mableton/Austell edition are available each month in the Mable House Arts Center, Mableton Pharmacy, Floyd Road Kroger, Publix; and in Austell: The Treadmill, Austell Food Store, Food Depot; and advertiser locations. Read the current issue on the web: www.www.brightsidecobb.com.